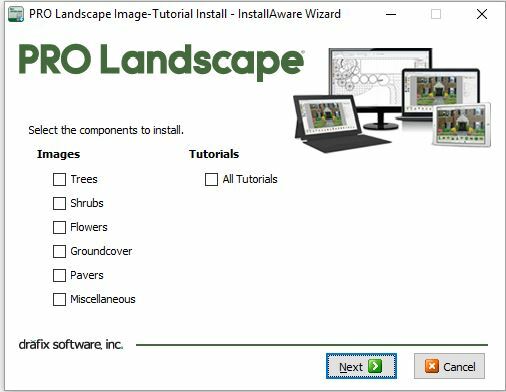 Starting with PRO Landscape version 22, users are given the option to download the program from the web. The install may take anywhere from one to several hours to install and in some cases, not all of the image library will be installed. Rather than restart the entire installation, we have provided a much easier method to install the image library as well as the video tutorials. Go into the C: drive and navigate to the following location C:/Program Files(x86)/Drafix/PRO Landscape/Support folder. Run the V22Image or V23Image application, depending on the version you have now. A window will appear to select and install the individual image libraries and video tutorials. We would recommend that you DO NOT install all of them at the same time but to install the libraries individually or in groups of 2 at a time. Once completed, re-run the application and install the next two libraries. As they are installing, monitor the downloads and tap your mouse every few minutes to make sure your system is not sleeping or hibernating. If for some reason the install fails, download the most recent update from the Support >> DOWNLOADS page and run the V22Image or v23Image application.